Finally, after many months of seemingly meaningless regular season games, the playoffs are finally here. From D.J. Augustin's game-winning three-pointer against the Toronto Raptors to both Kevin Durant and Patrick Beverley being ejected out of the Golden State Warriors vs. Los Angeles Clippers game, to even Blake Griffin's bench technical foul, it was an exciting weekend of postseason basketball. With just one game down and a minimum of three games left to be played in each of the first round series, there are still plenty of time for adjustments to be made and for teams to find a composure that maybe they just did not have during game one. For the Toronto Raptors, Philadelphia 76ers, and Denver Nuggets, dropping the first game of a best-of-seven-game series at home is a recipe for disaster as all three of these teams head into game two of their respected series facing must-win situations already. 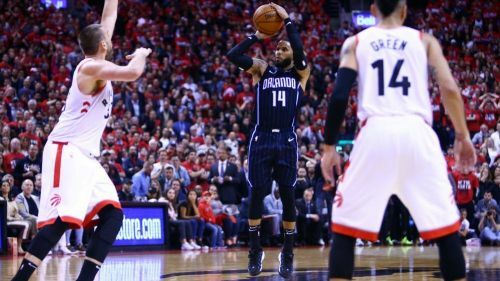 For the Orlando Magic, Brooklyn Nets, and San Antonio Spurs, game two of their series offers these teams the chance to take a commanding 2-0 lead heading back home to play two games where even one win would put them in an overwhelmingly superior position to advance into the second round of the NBA Playoffs. From James Harden to Damian Lillard, to D'Angelo Russell, to Stephen Curry, to Jimmy Butler, to Giannis Antetokounmpo, there was no shortage of special playoff basketball performances this weekend between Saturday and Sunday. During the NBA Playoffs, the truly elite basketball stars come out and give nothing short of special performances and this weekend was no different. The chase for the Larry O'Brien Championship Trophy is officially underway. With eight games taking place this weekend between Saturday and Sunday, here are five things that we learned/observed during the opening weekend of the NBA Postseason. 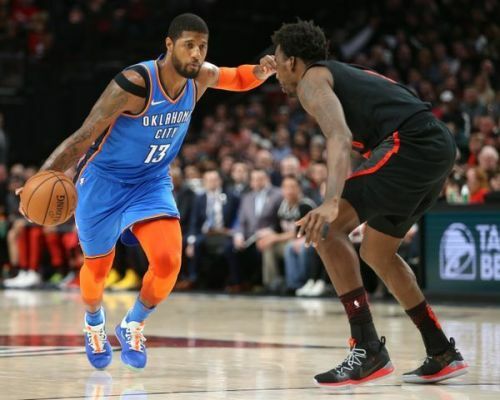 I recently wrote an article that featured how Paul George's offensive output against the Trail Blazers this season was going to make it hard for Portland to defeat the Oklahoma City Thunder. George averaged 38 points, 10.5 rebounds, 5.5 assists, and 2.77 steals on 44% shooting against the Trail Blazers in four regular-season matchups. On Sunday, George shot just 8/24 on field goal attempts including an abysmal 4/15 from three-point range. George, whose shoulder has been giving him issues for weeks now, was a game-time decision for his availability today. The Thunder have no chance of doing any damage this postseason if George's shoulder continues to be a lingering issue. Russell Westbrook, whose usage percentage this season (30.9%) was the lowest in three seasons since Kevin Durant's last season as a Thunder (31.6%) will probably look to play more hero ball if George continues to struggle shooting, which is the last thing the Thunder need. In the first two seasons in Oklahoma City post-Kevin Durant, the Thunder have won 3 combined playoff games with Westbrook sporting usage percentage numbers of 41.7% and 34.1%. This is nothing but a recipe for disaster for the Thunder.